Our club has volunteer positions open for snowmobilers or anyone else willing to lend a hand. If you enjoy the trails around Wilno, Killaloe, Pikwakanagan, Deacon, Golden Lake & Round Lake areas, get involved. There’s a place for you. For more info contact Mike at 613-625-2555 / 613-882-1599 or the Snow Country office at 613-735-8882. See you at the meeting! NORTH ALGONA WILBERFORCE RECREATION COMMITTEE SNOWMOBILE POKER RUN BEST POKER HANDS WIN !!! A FUND RAISER IN SUPPORT OF THE CLUB AND ALL OUR VOLUNTEERS THAT PUT ENDLESS HOURS INTO THESE TRAILS. PLEASE COME OUT AND SHOW YOUR SUPPORT AS THEY ARE DOING THEIR BEST TO PROVIDE THE TRAILS YOU RIDE. COME JOIN US FOR A RIDE FEBRUARY 9, 2019. If you bought online last year, simply access your account to view the information you have on file, update it as needed and you're good to go! Snow Country! District 6 Member Clubs need your support, so please Buy Where You Ride. Your Trail Permit Provides Great Year Round Extra Value At No Additional Costs! Click here to explore our Member Benefits. Cash bar and food avaliable. Join us for our annual Mystery Poker Run Saturday Feb 2, 2019. Register at the Timberline Clubhouse 11am-noon. Cost per hand is $10 or a chance for 5 hands @$20 (3 hands guarranteed). Participation prizes, 1st, 2nd & 3rd cash prizes, worst hand prize are available. Food available at our Canteen. Format same as last year, keep your eyes peeled for objects along the trail, record them and you could win our Mystery prize. Advertising is available in the upcoming 2019-2020 Snow Country Trail Guide. For more information contact the Snow Country office at 877-376-7669. Click on the image above, or follow this link to view a list of our sponsors. NOTE: Hours of operation may vary, please call ahead. OFSC Driver Training course at the Snow Road Clubhouse. Saturday Nov 18th. Pre-registration at 8:30am, course starts at 9am and goes to 4pm . Join us at the Sands on Golden Lake Resort for our monthly SCSR Meeting. 6:30pm start, open to members of our SCSR District 6 clubs. Snow Country Snowmobile Region is proud to have the following member clubs in our District: BonnTrae (Deacon), Calabogie & District (Calabogie/Arnprior), Eganville SnoDrifters (Eganville), Griffith Matawatchan (Griffith), Haliburton County (Haliburton/Minden), Keetna Snowmobile Club (Petawawa), Maple Leaf (Lake St. Peter/Bancroft), Missing Link (Deux Rivieres), North Renfrew (Deep River), Opeongo Snowbirds (Barry's Bay/Whitney), Peterson Pathfinders (Combermere), Snow Road (Ompah, Perth), Timberline (Pembroke), and Whitewater Sno-Goers (Renfrew),all members of Snow Country Snowmobile Region.You will find contact information for each club using the side menu as well as lists of all board members and a link to the club's website, if applicable. We're easy to reach and look forward to talking to you! Old and Antique Snowmobile Show. $5.00 entrance fee. Prizes for various categories. 9 am to 3 pm. Directly on the B102 trail. Bonfire to get warm. Free hotdogs. Vendors welcome. Swap and sale available. On Sunday February 18th on the A-trail west of Deep River at the Stopping Place from about 11:30am till after 2:30 pm. There will hot dogs, chocolate hot, bonfire plus a great opportunity to meet fellow sledders. Return to the Bear’s Den by 4:00 pm to draw your poker hand. Proceeds go to NRSA trail improvements and expense. Plus $2.00 (carnival button) for your entry to the winter carnival & chances to win prizes. Breakfast is available at the Lion's Hall, it's the Chalk River Winter Carnvial weekend. Community Dinner Hosted by CWL anytime after 2:00 p.m. Please visit The Weather Network for up to date information on weather conditions and forecasts throughout Canada or just type in the city you are looking for using the search feature above. The RAP tour showcases the best of Ontario snowmobiling in one remarkable circle tour Round Algonquin Park. Snowmobiling through OFSC Districts 6, 7 and 11, riders will experience incredible trails on an exciting mix of utility corridors, abandoned rail lines and old logging roads, plus sledding through the extensive forests of the rugged Canadian Shield. RAP will even take you on the only snowmobile trail through the world famous Algonquin Park! Seniors, families and couples wanting to “stop and smell the roses” during a leisurely 5 to 7-day getaway that is memorable and secure. Guided or customized tours can be arranged on request. Touring riders looking for an exciting 3 to 5-day self-guided adventure that consistently delivers the best snowmobiling in Ontario. High-Milers out to rack up maximum kilometres over an exciting long weekend on Ontario's premier trails. RAP is a tour designed by snowmobilers for snowmobilers. So you can rest assured that you will be well taken care of. RAP provides three levels of trail guides: the OFSC Provincial Snowmobile Trail Guide for big picture overview, the trail guides of District 6, 7 and 11 for regional details and contacts and a special RAP guide so you can see your entire tour on one pocket sized sheet. All trails on this tour are clearly marked with special RAP signage and major intersections have “You Are Here“ RAP signs. It doesn't get any better than Ontario's RAP tour, so why take a chance with your precious snowmobiling vacation? You'll be grinning from ear to ear every day and head home with a head full of amazing memories. Best of all, you will want to Ride the RAP again and again. Check it out this winter! Read Jeff McGirr's article on the RAP Tour on the NorthernOntario.Travel website. Join us for our monthly Snow Country District Meeting Tuesday Oct 17th at 6:30pm, downstairs at the Sands on Golden Lake Resort. Open to members of our District 6 clubs. Come on out and get involved - for info contact the SCSR office. (Barrie, ON October, 2017) – Some people are sad to say goodbye to summer, but snowmobilers in Ontario are revving up for the 2018 snowmobiling season. Club Name is working hard to ensure trails are prepped for when the snow comes. There’s lots of trail work that needs doing and new volunteers are always welcome. So it must also be permit buying time and here’s what riders need to know. After four years at the same fee, all 2018 Seasonal Snowmobile Trail Permits (including Classic) have increased by only $10 according to news received on September 29. This follows the approval of a spring recommendation from the Ontario Federation of Snowmobile Clubs to the Ontario Ministry of Transportation (MTO), which authorizes permit fees. Faced with rising operational expenses to deliver snowmobile trails and in support its of clubs and volunteers, the OFSC made a strong and urgent business case for the new fees, which barely cover the annual rate of inflation since 2013. The OFSC business plan also spoke to new fees being necessary to help cover the higher cost of continuing to purchase new groomers to improve trail quality and consistency. Since the 2015-16 season, the OFSC has invested $8.5 million to buy 35 new grooming units as part of its recently approved More On The Snow initiative. Snowmobilers can take advantage of 30% savings on their 2018 Ontario Seasonal Snowmobile Permit. For the low fee of $190 they can enjoy a winter full of adventure on any of the available 30,000 km of trails connecting communities throughout the province. This early rate is only available for a limited time. The fees go up at midnight EST on November 1, 2017. SCSA AGM & Elections will be held at 4pm Sunday May 28th at the Eganville SnoDrifters Clubhouse. Open to all member clubs of SCSA. Meeting will precede District meeting later that day. For info, contact Dale Jackson, Pres. at 613-646-7736. Notice of OFSC District 6 Annual General Meeting Sunday May 28th at 6pm. Eganville Sno-Drifters Clubhouse 475 SnowDrifter Road Eganville On. Meeting is open to all members of our District 6 clubs. Elections for Board positions to follow. Come out and get involved, for info conatct the office at 613-735-8882. Thank you permit buyers, volunteers and landowners! With the last grooming operations over as of early April, snowmobilers are being reminded to stay off OFSC Prescribed snowmobile trails from now until they become available next winter as the snowmobile season has come to an end. At its peak, this season saw 27,000 kilometres of OFSC trails ready to ride with the first snowmobiling opportunities available as early as December 10 and throughout the Christmas holidays in some areas. In all, snowmobilers obtained 108,617 permits for sleds that were used by over 190,000 family participants. Snowmobiling in Ontario generates $1.7 billion in economic impact annually. “We’ve had a great, albeit unpredictable winter in most parts of the province and would like to thank all of our clubs and volunteers for working especially hard to get trails in the best possible condition throughout the season for snowmobilers to enjoy,” stated OFSC spokesperson Lisa Stackhouse. The public is also reminded that an OFSC snowmobile trail on private land reported as “Unavailable” means that access to that trail is also prohibited for ATV’s or any other users or persons for all other seasons, without the specific prior permission of the landowner. To do so could result in a trespass charge and/or permanent closure of the trail. To support OFSC landowners, the Interactive Trail Guide on the OFSC website will be offline until September 1, 2017. Planning is already underway to provide yet another successful season of snowmobiling next winter. Although the winter is over, snowmobiling has become a year-round business. Many clubs will immediately start planning and preparing for next winter. If you are interested in helping out, please visit www.ofsc.on.ca to find out how you can get involved! Bonn-Trae S/C Annual General Meeting at 7:30pm. Our club has volunteer positions open for sledders or anyone else willing to lend a hand. If you enjoy the trails around Killaloe, Wilno, Round Lake, Golden Lake, Pikwakanagan areas, get involved. There's a place for you. For more info contact Mike at 613-625-2555 or the Snow Country office at 613-735-8882. See you at the meeting at the Sands Resort on Golden Lake. Registration is 10:30 til 12 noon at Logo's Land Cobden. Registration is $20 & includes a meal. Ride concludes with a large camp fire at Reasbeck's Camp. With great success, the Bonn Trae Snowmobile Club has revitalized an old tradition ... “Sinking of the Sled”. Over 20 years ago, Sands on Golden Lake's previous owner Leo McKillop decide to place a “Garfield” cat taped to a sono tube on the ice in front of the Sands. Mr McKillop did so in order to determine when the doomed feline would fall thru the thinning layer of ice. Customers alike would gather at the restaurant windows first trying to determine what the heck that fuzzy orange object was on the ice and secondly ... why? The reason, to raise money for the local Golden Lake fire department. With the unfortunate passing of Leo McKillop the winter tradition seized until 2009 when the Bonn Trae snowmobile club was donated a rather sad looking Yamaha. With a few coats of paint and a complete stripping of engine parts (MNR approved of course), the sinking of the “Sled” was born. Although fundraising fortunes aren’t necessarily made, the fun is explaining to folks why there is an abandoned sled on the ice and encouraging the curious (sledder or not) to try their luck as to when the sled will sink. What a terrific way to revitalize an old tradition and generate awareness to a most phenomenal winter sport. The NRSA has been part of the OFSC for 40 years. During the month of February help us celebrate those 40 years by touring selected trails, finding a sign and taking a selfie to submit to us for your chance to win. Draws will be made weekly for a $40 gift card. It's also Canada's 150 so at the end of the month we'll be drawing for a $150 gift certificate to a local business. Come play with us on our awesome trails in the great outdoors! Check our FB page & website www.nrsa.ca each week to find a picture of the sign and what trails it will be on. In conjunction with the Chalk River and Area Lion's Club Winter Carnival the NRSA will be having a Poker Run on Saturday Feb 4, 2017. Registration begins at 9am till 11am and poker hands are drawn upon registration. The Poker Run will Start from the Timberline Snowmobile Clubhouse At 1 PM .. Registration will take place between from 11 Am To 1 PM .... Poker hands are as follows: same as last year event $10.00 for 1 hand and $20.00 gets you a chance at 5 hands by flipping the Q of Spades but guaranteed at least 3 Hands.. Note to remember please leave hidden objects on trail for all to enjoy !!!! As for during last year event we had some people remove objects prior to all riders finishing the Poker Run . Doors Prizes will start drawing numbers at 4:30 PM Sharp please be present ... Poker hands Prizes will be 1st.2nd.3rd & Booby Prize ''' Now there will also be 1 prize set aside for the most hidden objects found ... That is why we don't want you to remove hidden objects Thanks again In advance From All The Volunteer's At your local Timberline Snowmobile Club ! In this section you can find information on businesses that are located throughout our trail regions. Whether you are looking for a place to stay for the night or a spot to fuel up, you'll find it all here. It's always a good idea to plan your trip ahead of time so you know where you can find essential services should you break down or need to take a rest. Use the menu on the right to find the accommodation type you are looking for. Each category is organized by region. MLSS is having a second Driver Training Coarse. Neil Crowder will be giving the coarse. You must be 12 years of age or older. Your birth certificate must be presented at the time of registration. Neil can be reached at 1-905-668-2896. Please leave a message and he will get back to you. We are looking for new and old volunteers to help groom and maintain our snowmobile trails this season. We will be holding a groomer training and risk management session at the Ash Grove on Thursday, Nov. 24th at 6pm. If you are interested in helping or learning more about other ways you can help, please come out for our session. Everyone is welcome! Must be 21 and hold a valid drivers license to operate the equipment, but teams (husband/wife, parent/child) are most welcome too! OFSC / MTO driver training course being held in Pembroke Jan14th, 2017 at the SCSA office #40484 Hwy 41. Pre-registration is required call 613-646-7736. 12years of age or older without a valid drivers licence. Cost is $40. Doors open at 8am, course runs from 9am to 2pm. OFSC /MTO Driver training course is being held in Pembroke Feb 4, 2017 at the SCSA office #40484 Hwy 41. Pre-registration is required call 613-646-7736. Open to those 12 years of age or older withoput a valid drivers licence. Cost is $40, doors open at 8am, course runs from 9am to 2pm. OFSC /MTO Driver Training Course is being held in Pembroke Dec 3, 2016 at the SCSA Office #40484 Hwy 41 Pre-registration is required - call 613-646-7736. Doors open at 8am, course runs from 9am to 2pm. 12 years of age or older without a valid drivers licence. Cost is $40. At the visitors centre in Barry's Bay (in front of the Balmoral Hotel/Restaraunt) on E109 trail. 6:30pm at the Eganville SnoDrifters Clubhouse Eganville on. Expect less groomer break-downs and better quality trails. A look at what the recent OFSC decision is all about and how it will affect local and visiting sledders. All positions are available. If we cannot elect a slate of Directors the Club will fold and local trails will close. Please plan on attending this meeting. Today, Ontario passed legislation that will sustain and improve the province's trails system, helping to build a healthier and more prosperous Ontario. Through Ontario’s 2015 Pan Am and Parapan Am Games Legacy, Ontario has supported the completion of 254 kilometres of the Trans Canada Trail Ontario resulting in a continuous route of over 2,000 kilometres, connecting communities from Ottawa to Windsor and Fort Erie to Huntsville. Annual General Meeting of the Bonn-Trae Snowmobile Club to be held at The Sands on Golden Lake Resort Tuesday May 3rd at 7:30 pm. Our club has volunteer positions open to snowmobilers or anyone else willing to lend a hand. If you enjoy the trails around Wilno, Killaloe, Round Lake, Golden Lake areas, get involved. There's a place for you. For more info call Mike at 613-625-2555 or the Snow Country office at 613-735-8882. See you at the meeting. Jon us for our regular monthly meeting Tuesday April 12th 6:30pm at the Sands on Golden Lake Resort. We hope to see you out for the meeting. Join us for our annual AGM & Elections Saturday May 7th at the Sands On Golden Lake Resort in Deacon. Meeting starts at 7pm, open to all members of OFSC District 6 clubs. Come out ang get involved. Join us for our regular monthly meeting. Open to all member clubs of the SCSA. At the SCSA office #40484 Hwy 41 7pm. (February 8, 2016 - Barrie, ON) The Ontario Federation of Snowmobile Clubs (OFSC) is once again celebrating Ontario’s Family Day Long Weekend (February 13-15) with an open invitation for a complimentary test-drive of OFSC trails. Since 2013, almost 30,000 riders who had not recently bought a permit have enjoyed the no cost Try Our Trails Weekend and many others are expected to be interested in this year’s event. However, with variable weather and uncertain trail conditions in many parts of Ontario, the OFSC is also strongly advising anyone wishing to test drive OFSC trails to double check trail status on the OFSC Interactive Trail Guide prior to riding each day (ofsc.on.ca>Trip Planner>TrailGuide). Lower than normal snow conditions and milder temperatures mean that sledding opportunities are more limited than usual at this time, especially in Southern Ontario, so snowmobilers need to take extra care to give themselves the safest possible riding experience while test-driving OFSC trails. Safe riding starts with the Trail Status view of the Interactive Trail Guide. 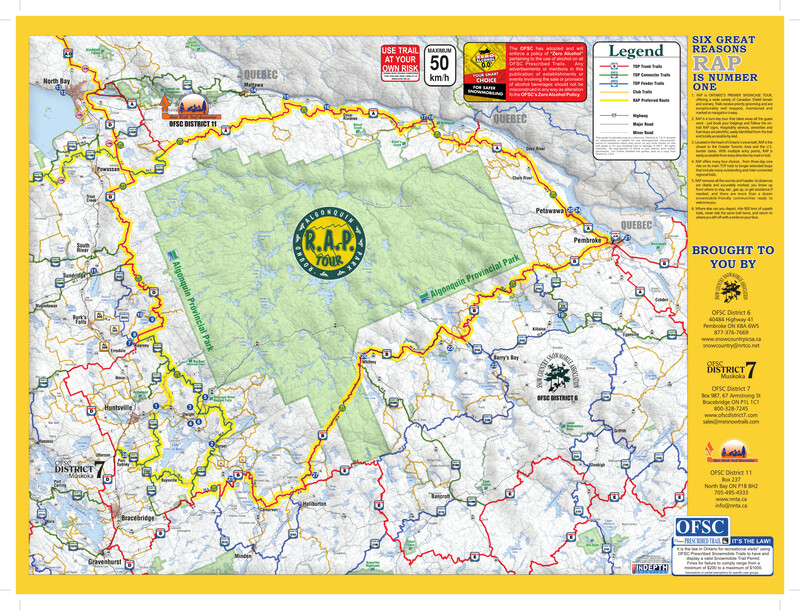 It provides an overview of the OFSC trail system, showing available trails (Green), Limited Availability Trails (Yellow) and Trails that are not available to ride (Red). Based on this information, Try Our Trails participants must make their own responsible decisions about whether or not to ride, where to ride and what trails to ride safely on Family Day Weekend. The OFSC also advises all snowmobilers to stay off frozen waterways in Southern Ontario. The OFSC primarily targets its Try Our Trails initiative to attract new participants and former riders, and to encourage more families to experience Ontario trails for the first time. Those wishing to take advantage of this complimentary offer must go online at www.ofsc.on.ca to register a sled(s) in advance for a no cost Try Our Trail permit, then print it out and affix it to the windscreen. Displaying this permit complies with Ontario law requiring recreational snowmobiles to have and display a valid permit to access OFSC Prescribed trails. Try Our Trails Snowmobilers Riders must also carry a valid driver’s licence or Snow Vehicle Operator’s Licence, sled registration, proof of insurance, and follow all the rules and assumptions for safe OFSC trail riding. The OFSC is committed to proactive leadership in promoting safe, responsible riding, on and off Ontario snowmobile trails, by building safer snowmobiling knowledge, attitudes and behaviours through rider education, safety legislation development and enforcement. Local musicians are welcome to our open music jam, at the Timberline Club House. 2pm to 4pm Come enjoy the local talent. Musicians are welcome to come play at the Timberline Club house from 2pm - 4pm. Come listen to local talent. All musicians welcome to an open music jam, from 2pm to 4pm at the Timberline Club House. Come enjoy the local talent. We will be hosting a pancake breakfast at the Timberline Club House on Saturday Jan 30th. $7.00 per person. Scrambled eggs, sausage, pancakes, toast, tea or coffee. We will start serving at 7:30am and go to 10am, or while supplies last. For the second year the Haliburton Country Snowmobiling Association is having a BBQ lunch on the rail trail at Gelert. Time 11:00 to 3:00 p.m. We will have articles to sell and prizes. One of the groomers will be on site. We will have club volunteers and students to help us out. Ask questions about the club. Plenty of snowmobile parking. Come out and have BBQ lunch for a small cost. Every one is welcome. On Saturday Jan 23 at 11:00 am, North Renfrew Snowmobile Association are having an official opening ceremony at the Deep River Park & Ride with Town of Deep River Represenatives. Location is just past 33185 Highway 17. Riding within the law and making smart choices is the only way to ensure an enjoyable ride that gets you home safely to your family at the end of the day. With the campaign getting underway this weekend, the OPP and OFSC are reminding snowmobile enthusiasts to stay off the lakes and waterways for the time-being as conditions are generally poor in many parts of the province. Stay on OFSC Prescribed Trails and don’t ride impaired, speed or ride after dark. In particular, the OPP and OFSC are looking to middle-aged males to ride with extra care and control this winter as 87 per cent of last season’s snowmobile-related fatalities involved male riders and 58 per cent were riders or passengers between the ages of 35 and 54. Watch out for parked vehicles and motor vehicles emerging from driveways. Always give motor vehicles the right of way. Be extra cautious when approaching intersections. Observe and respect all traffic signs. Slow down wherever snow banks obstruct your view. The motoring public is also being reminded to watch for snowmobiles along roads or those that cross roads at snowmobile trails. The OPP is committed to saving lives on Ontario’s highways, trails and waterways through the reduction of preventable injury and death. Initiatives are developed and delivered through the Provincial Traffic Safety Program. Many of the laws governing motor vehicle drivers apply to snowmobile operators, such as failing to stop for police on the trail, speeding, not coming to a full and complete stop at a road crossing, and driving with a Blood Alcohol Concentration (BAC) that exceeds the legal limit. Failure to comply with the law carries penalties including fines, loss of driver’s licence, criminal charges and/or imprisonment. Charges incurred while snowmobiling go on your driving record and can impact both your ability to continue to drive and affordably insure an automobile. More serious alcohol offences will result in licence suspensions that will prematurely end a rider’s snowmobiling season. Consequences also get tougher for repeat occurrences and riders are reminded that the Ontario Zero Tolerance law for drivers 21 and under also applies to snowmobiles. In addition, snowmobilers are reminded that both the driver and passenger must always wear a snowmobile helmet that meets the standards approved for motorcycle helmets, with the chinstrap securely fastened. Everyone who rides on a cutter, sled or similar device towed by a snowmobile must also wear a helmet. Riding a snowmobile is not permitted on 400-series highways and other high-speed expressways. Snowmobiles are also not allowed on the pavement of public roads where vehicles drive, on the ploughed portion of the shoulder or on public roads where prohibited by municipal law. The OFSC and OPP also advise snowmobilers to get properly trained. The OFSC offers two courses approved by the Ministry of Transportation of Ontario (MTO): OFSC Driver Training is a 6-hour classroom style course for snowmobilers aged 12 years and older. The Right Way is an interactive version of Driver Training for adults. ORILLIA, ON) – The Ontario Provincial Police (OPP) and the Ontario Federation of Snowmobile Clubs (OFSC) are reminding snowmobilers to take personal responsibility for their own safety and well-being when winter arrives. Safe snowmobiling starts with preparing your sled, gear and equipment before your first ride and maintaining these throughout the season. Good advanced preparations include getting properly trained and knowing the law. Think you have what it takes to be a safe snowmobiler? How many of these important steps do you take before and during your ride? (Barrie, ON. November 23, 2015) – The Ontario Federation of Snowmobile Clubs (OFSC) and its member clubs are celebrating the $1.7 billion annual economic impact of snowmobiling in Ontario and the coming sledding season during Get Ready to Go Snowmobiling Ontario Week, November 24 to 30. Following a 30% participation increase over the past two seasons, this year’s celebration starts with a robust 12% increase in pre-November 1st permit sales. Get Ready to Go Snowmobiling Ontario Week invites more people to discover the family fun of organized snowmobiling, plus its many social, health and recreational benefits. In addition, Get Ready Week is the cue for snowmobilers to prepare their sleds and gear, and to start planning their Ontario rides. This is possible because club volunteers are hard at work during Get Ready Week clearing, preparing and signing over 30,000 kilometres of OFSC trails to make them available when snow conditions allow. As well, Get Ready Week marks the final days that Seasonal and Classic Snowmobile Trail Permits are available at pre-December 1st savings by shopping online at permits.ofsc.on.ca or in a local retail outlet. 25 Snow Tours: The OFSC is promoting 25 snow tours located across the province to make snowmobiling even more accessible and enjoyable. These turnkey routes are specially selected to boost winter tourism by making it easy for riders of every experience level to enjoy unique snowmobiling adventures while visiting new destinations. Interactive Trail Guide: The OFSC Interactive Trail Guide features the most accurate and up to date display of the entire OFSC trail network available anywhere. This popular online tool enables OFSC snowmobilers to plan their rides and view the latest colour-coded trail status updates (Red = Trail Not Available; Yellow = Limited Availability; Green = Trail Available.) It also showcases the routes of the 25 Snow Tours. Early Season Priority (ESP) Trails: Snowmobilers looking for their first ride of the season can find it on ESP Trails. These OFSC trails on old logging roads, abandoned rail lines, utility corridors and unassumed road allowances will signal their early limited availability by turning from red to yellow on the OFSC Interactive Trail Guide as soon as they are ready to ride. Mobile Apps & Routable GPS: Ontario snowmobilers can check trail status from their smart phones by downloading the latest version of the OFSC trail network with the iSnowmobile Mobile App for Apple or Android. Snowmobile Ontario 1 routable versions of the OFSC provincial trail system are also available for Garmin GPS units. The Ontario Federation of Snowmobile Clubs (OFSC) is a volunteer led not for profit association that provides the voice for organized snowmobiling in the Province of Ontario. kids must be 12 years of age on day of course. Pre-registration is required. kids must be 12 years or older on the day of the course. Pre-registration is required. Students must be min 12 years old. Birth Certificate needed to proof of age. $40 includes course materials, and a hotdog/drink lunch. Safety should be your number one concern when riding the trails. Here are some tips that will help keep you safe and make your riding experience more enjoyable. NOTE: These links will take you to another site. OFSC District 6 Annual General Meeting Saturday May 23 7pm. Alice & Fraser Recreation Center #1 Henan Road Pembroke On. Closing Dance to follow. Open to all members of OFSC District 6 Clubs. Come on out and help us close out the season. In cooperation with the Ministry of Transportation of Ontario (MTO), the Ontario Federation of Snowmobile Clubs (OFSC) is celebrating Ontario’s Snowmobiling Family Day Long Weekend with the third year of the No Cost Try Our Trails Permit, available online at no charge and valid only from 12:01 AM Saturday, February 14 until 11:59 PM on Monday, February 16, 2015. The 2015 No Cost Try Our Trails Permit is available only by registering online at www.ofsc.on.ca, completing the Try Our Trails Permit application form and printing out a permit good for Family Day Long Weekend only. There is no charge for either the 2015Try Our Trails Permit or the registration process, but to access OFSC trails, the printed permit must be affixed to the sled to which it is assigned in accordance with Ontario law. Any sled on OFSC trails for recreational purposes without a permit on Family Day Weekend is illegal and can incur a fine of up to $1,000. Riders must also carry a valid driver’s licence or Motorized Snow Vehicle Operator’s Licence, sled registration, proof of insurance, and follow all the rules and assumptions for safe OFSC trail riding. “Try Our Trails” is the name of the 2015 permit approved by MTO as a result of a recommendation passed by OFSC clubs at their AGM asking for a no cost permit for Ontario’s Snowmobiling Family Day Weekend. What is the purpose of the 2015 Try Our Trails Permit? One purpose of the 2015 No Cost Try Our Trails Permit is to invite new participants, former riders and out-of-province visitors to try OFSC trails at no cost. We also want to encourage all regular permit buyers to invite their families and friends to register for a 2015 Try Our Trails Permit, so they can Take a Friend Snowmobiling. When Can I get a 2015 Try Our Trails Permit? 2015 No Cost Try Our Trails Permits are available from Monday, February 2 for Ontario’s Snowmobiling Family Day Weekend only – and are valid only from 12:01 AM Saturday, February 14 until 11:59 PM on Monday, February 16, 2015 inclusive. Where can I get a 2015 No Cost Try Our Trails Permit? The 2015 No Cost Try Our Trails Permit are only available from the OFSC Online Permits website any time from 12:01 AM on February 2 to 11:59 PM on Monday, February 16, 2015 by completing the registration form and printing out a permit from the follow up email you will receive immediately. Why do I have to get a 2015 No Cost Try Our Trails Permit online? Permit Required - Even though there is no cost for this new permit, Ontario law still requires that a sled entering OFSC trails for recreational snowmobiling must display a valid permit or be subject to a penalty. So anyone who wants to try OFSC trails on Ontario’s Snowmobiling Family Day Weekend requires a trail permit on their sled, regardless that it may be obtained at no cost. What is the process for obtaining a 2015 No Cost Try Our Trails Permit? The process for obtaining a 2015 No Cost Try Our Trails Permit is exactly the same as if a snowmobiler were going online to buy a permit, except that no payment is required and the permit is obtained immediately. The reason for using the same method is that this is the process that complies with MTO requirements for the OFSC to distribute their trail permits, and it has worked very well for the past two seasons. How does someone obtain a 2015 No Cost Try Our Trails Permit? To register for a No Cost Try Our Trails Permit please create a new account (or login with your existing account if you are a current online permit purchaser). Select the district and club where you plan on snowmobiling. Confirm your personal information, enter your sled information and select the Try Our Trails Permit from the drop down menu provided. Be sure to read all terms and conditions and check the appropriate boxes to continue through the form. When you have successfully completed the form, click the “Proceed to Payment Gateway”. Since there is no fee for the Try Our Trails Permit, you will not be asked for credit card information (if your order only consists of the Try Our Trails Permit). You will be given the option to print a receipt showing that no fee was paid. Your Try Our Trails Permit confirmation will be sent to you by email immediately. Please review the instructions and then print your permit (either in colour or black & white) and affix it to your sled. How do you affix a 2015 No Cost Try Our Trails Permit to your sled? Put it in a clear plastic packing slip envelope from an office supply store. These have adhesive backs. Laminate it and tape to sled. Affix to sled with clear packing tape that will allow it to be seen and also protect it from the elements. Place it in a ziplock baggie and tape to sled or attach to top inside of windshield with alligator clip. As backup, we also recommend that you print out a duplicate copy to carry in your pocket along with the required permit registration paperwork. In addition to a 2015 No Cost Try Our Trails Permit, what else do you need to legally ride OFSC trails? Riders must also carry a valid driver’s licence or Snow Vehicle Operator’s Licence, sled registration, proof of insurance, and follow all the rules and assumptions for safe OFSC trail riding. Number of students: The course size is limited to a maximum of 20 students at each training session. Where to get training: There are several clubs within the Snow Country Snowmobile Association that host Driver Training courses each fall. Please contact the SCSA office at 877-376-7669 for more information. MTO/OFSC Driver Training Course Saturday Dec 6th 8:30am -3pm at Hush Lodge #40621 Combermere Road Combermere On. Must be 12 years of age or older on day of course. Pre-registration is required. Call Linda at 613-646-7736. Lunch will be available at additional cost. Look's like we're in for another fantastic winter - and you can make this one even better by taking advantage of big savings on your 2015 Seasonal Permit! Buy online before midnight on Saturday, November 1st and your permit will be an amazingly low $180. Missing Link's Family Day Fun Run at Menet Lake Sunday Feb 15th. Snowmobile Ride for Dad event at the Timberline Clubhouse Feb 14th, 2015. Join us with the fight against Prostate Cancer. Registration starts at 7:30am #2 Henan Road Pembroke. Right on the TOP A/B & #122 trail system. Visit www.ridefordad.ca for info and pledge sheets. See you there! Join us for our annual Timberline S/C Monster Poker Run Saturday Jan 31st at 4pm. Evening run, bonfire checkpoint, lots of prizes. #2 Henan Road Pembroke, right on the TOP A/B & #121 trail. emial malian1965@hotmail.com for more info. NRSA Family Day Social is being held on Sunday Feb. 15, 2014. On the A-trail west of Deep River, (about 18 km - at the shelter) from about 11:30am till after 2:00 pm. Plus hot dogs, bonfire, a game or 2, club information & a great opportunity to meet & talk to fellow sledders. Bonfire and hot dogs will be available along the trail.Poker Run proceeds go to NRSA trail improvements. Come & join in the family activity at the Chalk River Annual Winter Carnival as well. Lion's club will be serving breakfast starting at 8am till 11am at the Lion’s Hall. The Ontario Federation of Snowmobile Clubs (OFSC) Snowmobile Trail Patrol Program commenced in 1983 at the time when snowmobile trails were being managed under a user-pay system. Trail Patrol Officers are dedicated Snowmobile Club Volunteers who regularly patrol Ontario's snowmobile trails, provide valuable trailside information to snowmobilers and promote the provincial user-pay system. For the individual who desires to contribute to recreational snowmobiling, a unique opportunity exists to join the Trail Patrol Program. It demands an adventurous spirit and a high degree of personal integrity. You will often deal in unstructured situations that will test your resourcefulness. For further information contact the Trail Patrol Coordinator at the Ontario Federation of Snowmobile Clubs. (Barrie, ON – October 1, 2014) – Last year, the Old Farmer’s Almanac forecast a snowy, cold winter for Ontario and it was right. Now, with the Old Farmer’s Almanac predicting another good, old-fashioned Ontario winter for this season, snowmobilers can catch a big savings break by purchasing 2015 Seasonal Snowmobile Trail Permits in October. 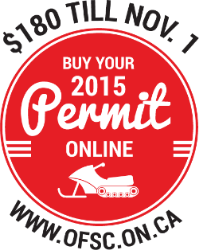 After a 21% permit sales spike last winter, the not-for-profit Ontario Federation of Snowmobile Clubs (OFSC) is selling Seasonal Permits again for a special pre-season fee of $180 when purchased online at www.ofsc.on.ca on or before November 1, 2014. According to recent consumer surveys undertaken by the OFSC, 93% of respondents said they were planning to buy as many or more permits for the coming season as they did last year. Noting that the $180-Nov. 1 option also attracted over 18,000 new permit buyers last winter, the OFSC is confident that with this incentive in place again, even more new participants and former riders will discover the fun of today’s snowmobiling at a very affordable cost for the coming season. Available on or before November 1, the $180 Seasonal Permit spearheads the success of a new business model for trail operations by the OFSC that debuted last winter. Known as “A Framework For Change”, the new plan is a comprehensive approach, including more permit types with varied fees, allocating more money where it snows each winter, and promoting more efficient trail operations across the province. “We think it’s important to keep OFSC snowmobiling as accessible as possible for Ontario families as well as for visitors from outside the province. That’s why the OFSC is very pleased with the success of A Framework For Change and a survey response from this past spring showing that 95.8% of snowmobilers believe that Ontario snowmobiling is enjoyable, very enjoyable or extremely enjoyable,” said OFSC Executive Director Paul Shaughnessy. The Ontario Federation of Snowmobile Clubs is a volunteer led not-for-profit association, which through strong leadership, provides a wide range of quality programs and services to, and on behalf of, its member organizations. Our provincial network of organized snowmobile trails connects Ontario communities providing responsible riding experiences that are safe, enjoyable and environmentally sustainable. Great News! The OFSC is holding the line on permit fees for the second year in a row, leading off with our best deal of the season - $180 if purchased online on or before November 1. Where to get training: There are several clubs within the Snow Country Snowmobile Association that host Driver Training courses each fall. Please contact D6 Master Instructor at 613-646-7736 for more information. SCSA General Meeting Monday October 6th at 7pm. SCSA office #40484 Hwy 41 Pembroke On. Open to member clubs of SCSA and their membership. Come on out - get involved with your local clubs. Scott Smaglinski of the Whitewater SnowGoers Snowmobile Club was selected as the Ontario Federation of Snowmobile Clubs (OFSC) Provincial Volunteer of the Year at our Annual General Meeting in Ottawa this past weekend. Scott was selected from 16 provincial nominations to this prestigious award. Your bold decision at last September’s AGM to make fundamental changes for organized snowmobiling is a HUGE success! Participation Up: Snowmobilers registered over 104,000 sleds for a 2014 Snowmobile Trail Permit of one type or another. This is the highest number of permitted sleds and participants in the last ten years. Permit Sales Up: 2014 full season permit sales (Seasonal and Classic) are up 21 percent over the 2012/13 season. This is the second highest number of full season permits sold in the last eight years. Permit Revenue Up: 2014 permit revenue is 20 percent more than Framework For Change projections and 13 percent higher than in 2012/13. Online Sales Up: Online sales increased by almost 400 percent this season, with two thirds of riders doing their permit transactions online, thereby substantially reducing your permit administration workload. Certainly it was a great winter, but your decision to implement A Framework For Change was the major driver for our success. Almost 80 percent of 2014 full season permits were bought pre-December 1 (compared to 74 percent last season) – that’s over 15,000 additional sales before anyone knew what kind of a winter it would actually be. So what’s next? As soon as all permits are reconciled and operations reports are in, the data will be analyzed and evaluated to determine what worked well with A Framework For Change, including the new funding model, and what needs to be improved. The board will receive a full report at their July meeting and the OFSC will ensure that this information is available to member clubs and that clubs are included going forward. If you have any questions or concerns, please discuss them with your governor. Meanwhile, give yourself a big pat on the back. You made the right choice to secure a strong future for organized snowmobiling in Ontario, so let’s celebrate at our 2014 convention in Ottawa, September 18 to 20! AGM April 30th 7pm at the Timberline Clubhouse. Open to all members of the TSC. Coffee & desert will be served We need volunteers to step up. Elections to be held after the meeting. Call Lorraine at 613-757-2830 for info. This was an awesome winter and the OFSC wishes to thank our clubs, volunteers, landowners, staff and every snowmobiler that bought a 2014 permit. Your continuing support makes Ontario snowmobiling the most fun on the snow! Participation Up: Over 100,000 sleds registered for a 2014 Snowmobile Trail Permit of one type or another. This is the highest number of permitted sleds since 2002. Permit Sales Up: Full season permit sales are up 15% over last season. This is the most full season permits sold since the 2008/09 season, including more than 10,000 new full season permit buyers for 2014. A majority of permits were purchased on or before December 1, 2013. Great news for our member clubs as the season started earlier than expected! It's Time to Put Away Your Sled! All good things come to an end... like the longest grooming season in years! But grooming operations across Ontario have now stopped or are in the process of winding down, so we're asking snowmobilers to stay off of all OFSC Prescribed Snowmobile Trails effective immediately as the snowmobile season is over. Rapidly deteriorating snow and ice conditions due to spring thaw make snowmobiling extremely hazardous everywhere, while signs and stakes are being removed and gates and fences closed. Thanks for your cooperation and we'll see you again next winter - same time, same place! SCSA AGM & Elections Saturday May 10th 4pm. Sands on Golden Lake Resort in Deacon. Join us at the Sands on Golden Lake Resort 7pm May 10th for our Annual General Meeting & Elections. Members of OFSC District 6 Clubs are most welcome to attend. For info, contact the Snow Country! office. Notice of ANNUAL GENERAL MEETING, 7pm, Sands on Golden Lake Resort. Our club has Volunteer positions open for Snowmobilers or anyone else willing to lend a hand. If you enjoy the trails around the Wilno - Killaloe - Round Lake - Golden Lake area. Get involved, there's a place for you! For info, contact Mike at 613-625-2555 or the Snow Country office at 613-735-8882. See you at the meeting! 7:30am to 11am Saturday Feb 1st. located on#139 trail just off the TOP A/B south of Pembroke. The buzz around Ontario snowmobiling this season is all about tour loops and loop riding. Although many loops have been around for a while, others are just getting started. So what can riders expect this season? All loops are not the same and have been created to meet the varying needs of riders in various parts of the province. Some are primarily saddlebag loops, while others are more for day-tripping recreational riders. Some are longer and others are shorter. Some are close to many towns and others are more remote. The whole loop concept is a work in progress. This season, the OFSC is promoting eight selected tour loops. These loops are showcased in the Go Snowmobiling Ontario Magazine, the 2014 Provincial Trail Guide and online Interactive Trail Guide, and on participating district websites. The OFSC is committed to improving rider experience by continuing to develop, improve and enhance our loop circuit this season and in the future. Visit our website at www.ofsc.on.ca for more information and how you can participate to improve these exciting snowmobiling experiences. Thanks for buying a 2014 Snowmobile Trail Permit! Your support has helped build permit sales this season into a good news story for everyone. Our latest figures reconfirm that changes already underway for organized snowmobiling in Ontario are already yielding positive results. December 1 permit sales have continued the growth trend started with the early success of Pre-November 1 online sales. In fact, 13,000 more Seasonal/Classic Permit Buyers committed to OFSC snowmobiling prior to Dec. 1 this season than last year at Dec. 1. Best of all, as of this newsletter, more permits have already been sold in total than all of last season! Happy sledding and take it easy on OFSC Trails! Mobile App: Get iSnowmobile for your mobile phone today! -Carry the world's largest snowmobile trail network conveniently in your pocket. -Plan your ride in any area of the province with OFSC prescribed trails. -Over 19,000 Points of Interest including gas stations, cellular towers and more. -Routable mode with integrated map background. -Topographic data including mountains, hills, valleys, lakes, rivers and forest zones. -Buildings, roads, electric lines and other landmarks. Riders who purchased the 2012 version of the GPS product within the last 12 months may qualify for the special upgrade price of $10 until January 31st, 2014. After the deadline TrakMaps will provide you with 50% off the regular purchase price. To be eligible for this offer, proof of purchase is required. -Moderate your pace according to conditions. -Watch out for parked cars and vehicles emerging from driveways. -Always give motor vehicles the right of way. -Be extra cautious approaching intersections. -Slow down wherever snow banks obstruct your view. Please include your contact information so we can reach you if necessary and we'll accept your email as your permission to use your photos. Here's an article every snowmobiler should read from the latest issue of Snow Goer Canada magazine. It's a comprehensive look at the state of snowmobiling in Canada today, with input from real riders to the four manufacturers. A great reality check for everyone who loves to snowmobile. FRIDAY - DRIVER PRACTICE 1P.M. TO 4.P.M. In its second year, Blast from the Past Vintage Snowmobile Show & Sale is part of the regional "Think Snow"...Family Winter Fun activities happening on Family Day Weekend, February 14 - 16th. Check out the full schedule of events on www.northhastings.com Show your sled for free, vendors pay $10. Prizes awarded by the Bancroft Business Improvement Area. Make it a weekend in Bancroft! Dog sled races, fishing derby, skating, Fur Harvesters Workshop, Fish Hatchery tours, fly tying workshop, winter story time for the kids, bonfire, sleigh rides, hot chocolate...and so much more! There will be a Trail Patrol and recertification course on January 18 2014. This is starting at 9 am. DriverTraining LEARN THE RIGHT WAY.... Get Started with a driver training course! Must be 12 years old on or before the day of the course. Must present a valid form of identification at course registration, such as a birth certificate or photo health card. Course Date Jan 25 8:30 to 15:30. All Courses Require Pre-Registration Call Linda Jackson 613-646-7736 locations 40484 Hwy 41 Pembroke Ont. Here's what you need to know to enroll: •Cost is $40.00 per course (includes all required course material) •Driver Training courses are in-class only •Must be 12 years old on or before the day of the course. •Must present a valid form of identification at registration (Birth Certificate or Photo Health Card) •Course will be approximately 8 hours including registration, lunch and breaks. Bring your lunch, snacks and water for the day, dress comfortably. •Please do NOT bring cell phones, IPOD/MP3 players or any other electronic device. Thank you! Family Day Weekend our trail patrollers will be out on the trails to educate snowmobilers about the sport and our trail system. Come out for casual snwmobile run, ice fishing and campfire lunch. Visit our website for more details. Signage & R/M training at the Snow Country office Thursday Nov 21st at 6pm. Open to all member clubs of District 6. Snowmobile Operator Training course Saturday Nov 23rd at the Snow Country office in Pembroke. Must be 12 years of age or older or 16 or older without a valid drivers licence. Snowmobile Operator Training course Saturday Dec 21 at the Snow Country office in Pembroke. T he upcoming snowmobiling season has received an unprecedented kick start by setting a new trail permit sales record announced just as snow has already started to fall in many parts of Ontario. On October 10, the Ontario Federation of Snowmobile Clubs (OFSC) launched a Pre November 1 permit promotion offering snowmobilers an opportunity to save money by purchasing a trail permit online and tens of thousands of Ontarians responded enthusiastically, racking up pre season numbers of 41,589 Seasonal and Classic Trail Permits, the largest and earliest sales total in OFSC history. Snowmobile Poker Run on Saturday Feb 1st. Registration 10am - 12:30pm. Call 613-586-2761 or visit www.missinglinksc.ca for more info. Seasonal Permit - Seasonal Permits are available from clubs on or before December 1 for $210 – a saving of $50 off the regular permit fee of $260. Snowmobilers purchasing online at www.ofsc.on.ca can save an additional $7.50, thanks to no charge for Seasonal Permit processing fees until Dec. 1. Classic Permit - Any snowmobiler owning a sled that is model year 1999 or older is entitled to buy a 2014 Classic Permit. Primarily available online for $140 on or before December 1, a Classic Permit offers a saving of $30 off the regular fee of $170. Classic Permits are also available on a limited basis at retail; contact OFSC district offices for locations. OFSC trails are marked, mapped and maintained for the use and enjoyment of permit holders. Ontario law requires any snowmobile entering an OFSC trail for recreational sledding to display a valid permit. For more information on 2014 Snowmobile Trail Permits visit www.ofsc.on.ca. Toronto International Snowmobile ATV & Powersports Show Oct 25-27 2013. See us at booth 3516. Club meeting at 7pm at the Sands. All members welcome. We need volunteers so come on out if interested. SCSA monthly meeting 6:30pm at the office. Open to all members of SCSA & member clubs. "The Biggest Old Sled Show in Ontario"
With the Farmer’s Almanac forecasting a snowy, cold winter for Ontario, participating snowmobilers can catch a big savings break by purchasing 2014 Seasonal Snowmobile Trail Permits earlier than usual. The not-for-profit Ontario Federation of Snowmobile Clubs (OFSC) is pleased with the province's recent decision to approve a new fee of only $180 for 2014 Seasonal Permits bought on or before November 1, 2013. This limited offer is only available for permit transactions completed online at www.ofsc.on.ca. The Ontario Federation of Snowmobile Clubs (OFSC) and the Ontario Federation of All Terrain Vehicles (OFATV) urge all motorized riders to be responsible by respecting landowner rights. (ORILLIA, ON) – The Ontario Provincial Police (OPP) and the Ontario Federation of Snowmobile Clubs (OFSC) remind snowmobilers that their safety, peace of mind and enjoyment while sledding this winter start with being compliant with the Motorized Snow Vehicles Act (MSVA) and being properly trained. Many of the rules governing motor vehicle drivers apply to snowmobile operators, such as speeding, failing to stop at a road crossing and driving with a Blood Alcohol Level (BAC) that exceeds the legal limit. Failure to comply with the law carries penalties including fines, loss of driver’s licence, criminal charges and/or imprisonment. MTO/OFSC Driver Training course will be held Saturday December 8th, starts 8am. Course is available to snowmobilers over the age of 12 years without a valid drivers licence. Pre-register at 613-646-7736. SCSA General Meeting Thursday Dec 6th 7pm. Open to member clubs of SCSA and their membership. Come on out and get involved. The operation of Ontario snowmobile trails is solely funded by snowmobilers buying permits. Ontario snowmobiling does not benefit from any dollars from fuel taxes, sled registrations or other government largesse for regular snowmobile trail operations. So OFSC snowmobile clubs must rely on snowmobilers buying enough permits — and purchasing them early enough — to pay the considerable start up costs for trails and equipment each fall.